Through tough times music artists have used their music or performances to push boundaries and comment on topics such as police brutality. Music made as commentary, like “Alright” by Kendrick Lamar, has spread like wildfire. People even began using it as a protest song. The lyrics were chanted by protesters at Cleveland State University in the summer of 2015 (where an officer pepper-sprayed the crowd). The Guardian claimed Lamar as “one of the most outspoken rap artists about violence affecting African-Americans.” Kendrick Lamar isn't the only artist with powerful music making waves - singers like Janelle Monae with her song “Hell You Talmbout” featuring Wondaland Records are also tipping the scales. In the song, various names of those shot and killed by officers are named. In addition, there are songs like “Don’t Shoot” which is a collaboration between numerous rappers (including Rick Ross, Wale, P. Diddy, and more). The song commented on the current violence from police occurring in communities. The songs and work created by these artists help shed light on social and cultural issues, continue important conversations, and represent hope for a better future. Music continues to play an active role in social movements, one that is only getting bigger. The first ever Movement for Black Lives Convening took place from Friday July 24th to Sunday the 26th at Cleveland State University, bringing together more than 1000 civil rights activists from across the country. The conference included leaders from Million Hoodies Movement for Justice, Ferguson Action and Cleveland Action to discuss what's next for the Black Lives Matter movement. Even as the train of relatives and loved ones of black people killed by law enforcement officials walked across the University stage, the was absolutely no doubt that the conference was about "the defense of black bodies, the celebration of black collective resiliency, and the building of a movement the likes of which has never been seen." The family members all shared memories and little details about their murdered loved ones reminding everyone of the things that made them human; their favorite colors, sports teams and nicknames. A vital aspect of the convening was the role the LGTBQI community played. "Through the crucibles of New York, Cleveland, Ferguson, and dozens of other less notorious battlegrounds, a new generation of black change agents has emerged—people who are organizing youth, queer, and transgender folks, women, immigrants, the differently abled, and other black communities. #BlackLivesMatter has been the rallying cry." The projection of the LGTBQI community and youth at the gathering depicted the emergence of a new, strong force in the overall fight against police violence. The conference organizers astutely recognized that the gathering was really a networking hub and fueling station for a thousand self-powered movement engines, and all of these different parts demanded future gatherings. "FBI statistics from 2007 to 2012, according to a Ohio legislature fiscal note, found a record-high 63 hate crimes in Ohio in 2012 against people for their sexual orientation. There was no FBI data on transgender people for those years." Bri Golec, a 22-year-old living in Akron, Ohio, was just beginning to explore a transgender identity when stabbed to death by their father February 13, 2015. Kevin Golec, 52, has been charged with murder and felony domestic violence. Police detained him shortly after 10 p.m. Friday after responding to several calls to 911 he made alleging that several members of a "cult" had broken into his house to commit robbery and had attacked both him and Bri Golec. With no evidence of a robbery, however, police determined that Golec was lying and that it was he who had had an altercation with and fatally stabbed his child. Tiffany Edwards, 28, was shot to death in Walnut Hills, Ohio, a suburb of Cincinnati, on June 26, 2014. Quamar Edwards — who is not related to Tiffany — turned himself in six days later, after police issued a warrant for his arrest. In attempting to justify his actions, Edwards reportedly voiced a "trans panic" defense through an uncle, who alleged that the assailant "lost his cool" after Tiffany "came on to him." While it remains unclear whether Quamar Edwards drew on this defense during his trial, an argument that excuses a murderer by claiming his internalized transphobia "drove" him to kill has been repeatedly discouraged by the American Bar Association and was banned in California in September. The LGBTQ community is exiting 2014 on a tragic note with the death of Leelah Alcorn, a 17-year-old transgender teen from Ohio who, according to reports, committed suicide early Sunday morning. Alcorn’s passing has become an international story due to the public nature of the event—she was struck by a tractor-trailer on the interstate—and to an eloquent Tumblr post that she had scheduled to go live in the event of her death. In her post, Alcorn speaks of her Christian parents’ refusal to accept her trans identity and her sense that life could not get better if she had to wait to transition any longer. She committed suicide by walking out in front of oncoming traffic on the Interstate 71 highway. In December 2015, Cincinnati became the second U.S. city after Washington D.C. to ban the practice of conversion therapy outright; council member Chris Seelbach cited Alcorn's suicide as an influence in the decision, stating that "She challenged us to make her death matter, and we're doing just that. Cernia 'Ce Ce' Dove (Acoff), 20 years old, was stabbed to death in the Cleveland area on January 5 by Andrey Bridges, authorities later confirmed. Ce Ce's decomposed body was found April 17 at the bottom of the Olmsted Township retention pond, stabbed and with a rope tied from her waist to a concrete block. She was 20 years old. It took two weeks to identify her through DNA records. She had been reported missing on 27 March 2013 (via wiki). In November, her killer was convicted and sentenced to life in prison with the possibility of parole after 20 years. Following her murder in April 2013, CeCe Acoff was treated to a massive dose of sensationalistic, incorrect reporting. Describing her as an “oddly dressed man,”The Plain Dealer smeared Acoff and attacked her character. In the two stories about her: “Brutal slaying marks the end of Cleveland man’s fight for acceptance” and “Oddly dressed man found in Olmsted Township pond identified,” Acoff is never actually identified as a woman, and is never once referred to using she/her pronouns. After GLAAD became involved with The Plain Dealer‘s “horrific coverage,” the paper edited the online version of Acoff’s story by going out of their way to avoid all pronouns rather than treat her with even a tiny amount of respect. 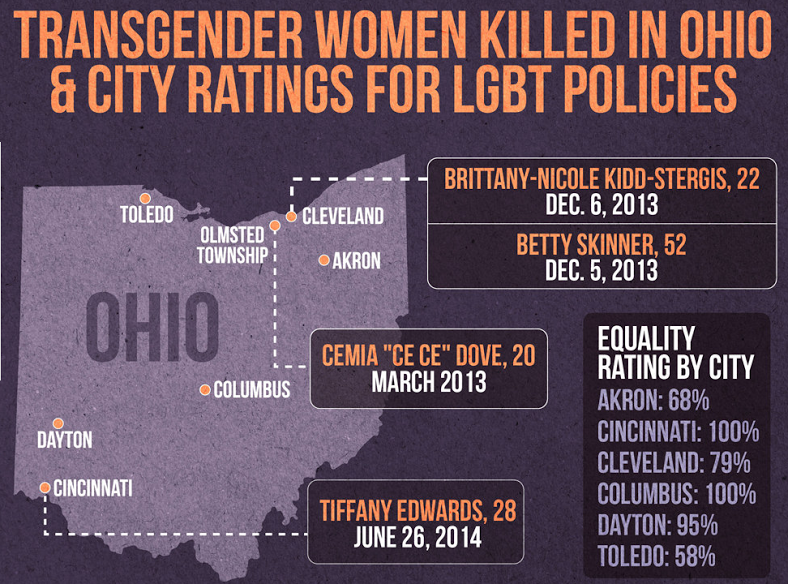 The body of Brittany-Nicole Kidd-Stergis, a 22-year-old transgender woman of color, was found in her parked car on the 21200 block of West 25th Street in Cleveland, outside a public housing facility, around 2:30 a.m. Friday (December 6, 2013), according to the Cleveland Plain Dealer. She died of an apparent gunshot wound to the head. Six months later, 19-year-old Delshawn D. Carroll was sentenced to 18 years to life in prison after confessing to the murder. While motive remains unclear, officials say that Stergis, who was an aspiring cosmetology student, knew her killer. 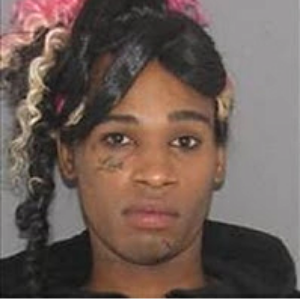 Kendall Hampton, the 26 year old transwoman who was shot and killed in the Cincinnati metro area suburb of Walnut Hills, OH in August 2012 who was subsequently misgendered by the local media. Eugene Carlos Dukes, 19, was arrested in early September for the murder of Kendall Hampton, 26.